In November 2014, a long overdue book about the sphinx-like Gazmin was launched. 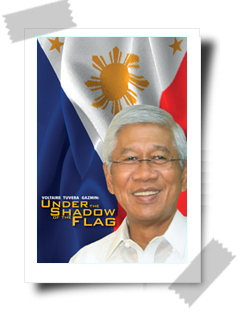 In keeping with the manner and style of its subject, Under the Shadow of the Flag tells how Volts has been the self-effacing but well-respected soldier and field officer, the unwavering and inimitable military official, and the diplomat and public servant whose loyalty lies ultimately with the Filipino people. And most of the stories attesting to his qualities are told by the people who personally saw the man in action. “Kailangan pa ba iyan? Is that necessary? Hindi na.” That was Gazmin’s initial reaction when his brother-in-law Gaudencio “Goody” Hernandez Jr. first broached to him, over lunch, the idea of a book about his life. The private other half of his life is told as well among these pages: the loving husband and father who, despite the demands of his job, sought to stay as close as possible to his family; the firm believer in the tenets of the brotherhood of Masonry; and the grandfather of the twice-interrupted retirement who took his “apostolic work” (doting on his apos) very seriously.